By Melissa 3 Comments - The content of this website often contains affiliate links and I may be compensated if you buy through those links (at no cost to you!). Learn more about how we make money. Last edited July 25, 2016 . My husband and I have been tackling our debt for a while now, and we’d made good progress. We were finally to the point where we could kill his student loan debt, and then we would be debt free. We saw the faint sunlight at the end of a very long tunnel, and we knew the end was near. When we bought our house two years ago, we knew that the central air conditioning unit was very old. We knew it would need to be replaced sometime in the near future. 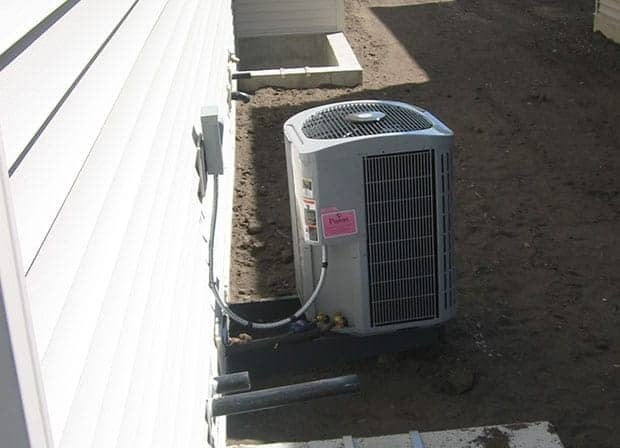 (Since we live in Arizona, a central air conditioning unit isn’t a luxury but a necessity). We hoped we’d have time to save for a new unit, though the price was daunting. But, of course, these types of expenses don’t wait until the time is right. On the 4th of July, our A/C unit died—permanently. And we had to take out a loan to pay for the new one. After so much time paying off debt, to take out a new loan felt like a serious defeat. My husband and I both wallowed in misery a bit, but then I decided that our attitudes will make the difference. This is just one more challenge that we can overcome. When you feel down and depressed, making any financial headway is difficult. But when you feel optimistic and have a can-do attitude, you can attack the debt, old and new. Even though it may be hard, try to have a positive attitude. Realize this is just one small bump in the road. Often, when people feel the weight of debt hanging over them, they rationalize additional spending. After all, what does another $50 or $100 matter when you’re already in debt? This thinking is dangerous and can erase all your progress. Do everything you can to avoid accumulating any more debt. While we can’t pay off our entire air conditioner debt right now, we can make a dent in it immediately. We have stuff around the house that we’re listing on eBay and Facebook. We’re going to have a garage sale this summer. We’re cutting back on groceries and eating more from the pantry and freezer. All the money from these endeavors will go immediately on our new debt. Making a big dent in the beginning can be encouraging and help you stay motivated while you tackle the rest of the debt. Instead of letting the new debt linger indefinitely, make a plan for how long you’ll give yourself to pay off the debt. In our case, this debt is interfering with our plan to pay off our student loans, so we want the air conditioner debt gone in 12 to 18 months. Sometimes when you set a timeline, you have to exceed reality. Looking at our budget, there is NO way this debt will be paid off in 12 to 18 months, but that’s still where we’re setting our goal. As we receive extra, unexpected money, when my husband gets a raise, when I have extra work, or when we’re under budget for the month, we’ll funnel all of that money to the debt. Even though paying it off so quickly doesn’t work on paper, having a target date that you’re working toward can reap amazing rewards. How do you handle financial setbacks and make sure they don’t complete derail your financial plan? Getting your finances together and winning financially doesn't always make sense. In fact, sometimes, it defies financial logic. Does Being In Debt Affect Your Judgment? Can having a tight budget affect your financial decision making? Some studies suggest that it may. Last Edited: 25th July 2016 The content of biblemoneymatters.com is for general information purposes only and does not constitute professional advice. Visitors to biblemoneymatters.com should not act upon the content or information without first seeking appropriate professional advice. In accordance with the latest FTC guidelines, we declare that we have a financial relationship with every company mentioned on this site. Great post, Melissa. We had a serious financial setback last year. Some huge personal crises and major home repairs put us deeper into the hole in a big way. It was tempting to just give up. Your advice is spot on, especially about having a good attitude. It’s important to let yourself be upset and get those emotions and frustrations dealt with, but it’s even more important to get back on the horse and get to work. My own interim financial crisis is a bit more severe, but I too have decided to turn lemons into lemonade. First, a major financial crisis such as mine does a LOT to uncomplicated finances, so I am using the opportunity to start tracking my finances with the mint.com service Peter recommends for people with, errr, simplfied finances such as my own. Second, .my financial crisis has allowed me to notice things like which of my friends enjoy spending time with me only if I can afford to spend my time doing such things as going out for coffee or going out to a ballgame, (currently unreachable luxuries for me), and which friends just plain want to share time with me, even if it means (gasp) nothing more than drinking ice tea on my patio at sunset. So, my setback is severe enough that for now I eat a lot of pasta and I’ll probably never own a vacation home. Jesus lived on less and with this crisis, God has given me an opportunity to learn some truly important things.